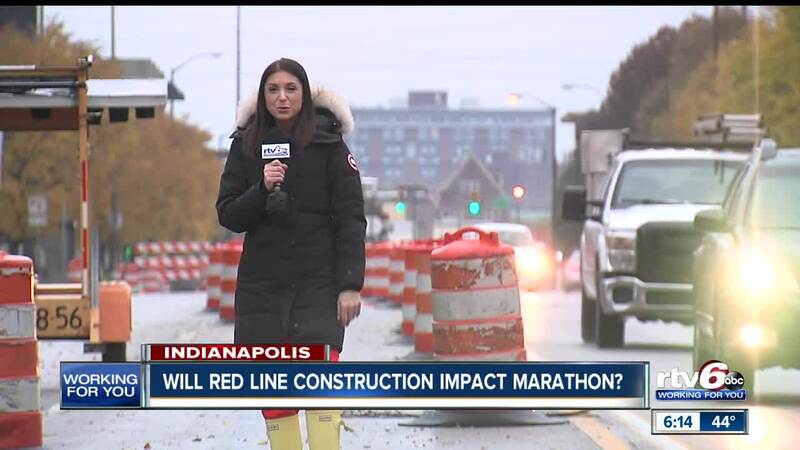 Will IndyGo Red Line work impact Monumental Marathon? The Monumental Marathon will be in Indianapolis this weekend. But part of the race course runs right through IndyGo Red Line construction. So what impact, if any, will this have on runners? The good news is, there’s a plan in place. INDIANAPOLIS - The Monumental Marathon will be in Indianapolis this weekend. But part of the race course runs right through IndyGo Red Line construction. So what impact, if any, will this have on runners? The good news is, there’s a plan in place. IndyGo’s director of public relations, Lauren Day, said IndyGo has been working with the Monumental Marathon for years, even prior to construction, to make sure all races smoothly. "For the course portion that's between 18th and 30th, so that's both the Marathon and the Half-marathon on Meridian, we are going to clean up the space,” Day said. Cleaning will be underway Friday night, as crews will be transforming the current two lanes for travel on Meridian Street into a wider artery for runners. No driving traffic will be able to make its way down that stretch of Meridian Street between West 18th and West 30th streets while the marathon is underway. As for runner safety, when it comes to any leftover debris, that'll be taken care of, too. "It's going to be swept, cover up any holes, fill in any potholes,” Day said. "We wanted to work with Monumental Marathon and make sure the runners experienced the same situation as they've had in the past. And so, making sure they had room, three lanes open for them, is really important. So, we're going to make that possible," Day said. Those cones and restrictions in place along Meridian Street will be back in place on Sunday. For anyone who uses public transit, keep in mine that IndyGo bus routes will also be disrupted. Be sure to check your route and how the marathon might impact it. You can do so by clicking here . For a look at the roads impacted by the marathon, click here .